Over looking the Spectacular Lake Superior. 27 holes. Abundant wildlife. It’s no secret that we love Superior National at Lutsen. They have been a terrific partner to Golf Minnesota since we started publishing in 1996, and we always love telling our readers and followers about this true gem on America’s North Coast, a.k.a. Lake Superior’s North Shore. In 2010, for our 10th Anniversary Edition, we named them our ‘Resort of the Year’. It was then, and is now, a sort of odd designation, when in truth, Superior National is one of America’s best municipal courses. Owned and operated by Cook County, Superior National at Lutsen sits high above the world’s largest fresh water lake. 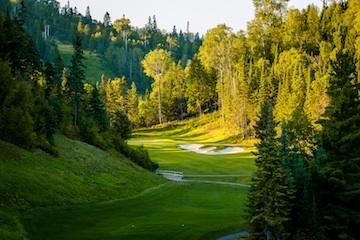 The Superior National Forest surrounds the course and the spectacular Poplar River meanders throughout. Originally designed in 1991 by Minnesota-based architect Don Herfort as an 18-hole layout, Superior National at Lutsen was expanded in 1999 by designer Joel Goldstrand. Routing varies on different days with the three nines appropriately named The River, The Canyon and The Mountain. As every course does, around the 25 year mark of its existence, Superior National at Lutsen began to show signs of age. The scenery was still spectacular, but the conditions had deteriorated and a facelift was needed. 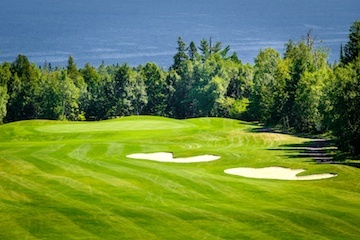 With some $4.5 million to work with, enter Jeffrey Brauer, Dallas-based architect whose work in Minnesota had become well known with the creations of Giants Ridge Legend Course, Giants Ridge Quarry Course and The Wilderness at Fortune Bay. Brauer’s work had been noticed by the powers that be at Superior National and he was hired to spearhead their renovation. While a lot of what Brauer did was simply tweaking what was already there, he also included some significant design changes. The River Nine was the first to get a makeover and it went from a par 36 layout to a par 35. He did this by eliminating a not-too-great par-3 and an awkward par-5 (the old 8th hole) and replacing them with a long par-4, a short par-4 and a very good par-3, now the 8th hole. In addition to the improvements to the general layout and playability, Brauer also made significant enhancements to the green complexes, making many of them larger and ‘friendlier’ and seeding them with a mix that should work well in the harsh climate. The entire irrigation system was also improved. While the Mountain Nine has not yet undergone the types of changes the rest of the course has, it remains in our estimation, the most difficult of the nines and is now offering Foot Golf as an alternative recreational activity. It makes sense as this nine sits in close proximity to the Lutsen Ski Resort and has the kind of layout made for running and kicking. Incidentally, Superior National also offers Golf Bikes, a bicycle alternative for getting you and your clubs around the course. These are really ideal for mountain-biking and fitness enthusiasts. Early on, I mentioned that we named Superior National at Lutsen our Resort of The Year. While it is not a resort in the traditional sense of on-site lodging, dining, spa, etc., it is located in one of the premiere vacation destinations of North America. Situated along US Highway 61, the North Shore runs from Duluth to Thunder Bay, Ontario. There are mom and pop motels and luxury resorts dotting the entire drive, with the Lutsen-Tofte area of Cook County offering many of the most popular lodging spots. A few are included in their advertisement on the inside front cover of this magazine. One of the great things about having a 27-hole layout was that Superior National at Lutsen was able to always offer an 18-hole place to play, while closing the nine that was being renovated. Now that the work is done, at least for now, all 27 holes are in play and the entire course is positioned for a great run. We can’t wait to get back on this long-time Golf Minnesota favorite. You know you’re likely to have a special piece of property when the original deed was signed by President Grover Cleveland in 1886. The great-grandfather of George Nelson first set up a homestead here in 1885. 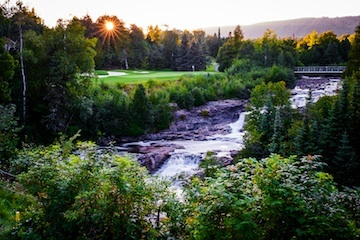 George, father of Olympic skier Cindy Nelson, was the visionary who donated this 325 acre parcel for the development of Superior National Golf one hundred years later. Those charged with moving George’s vision forward through the past three decades have done nothing short of amazing. The course was terrific as an 18-hole layout in the beginning. It reached spectacular when it became a 27-hole track a few years later. With the improvements done the past few years, the superlative is hard to come up with. Let’s just say this: If you play golf in Minnesota, you need to play Superior National at Lutsen.